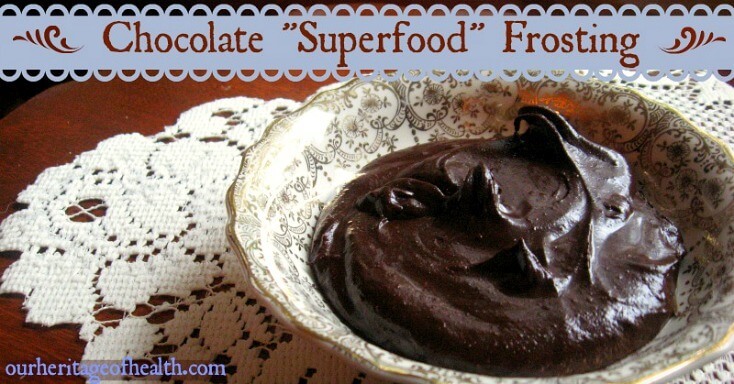 When you hear the word “superfood,” what is the first thing that pops into your head? Chia seeds? Gogi berries? Flax seeds? Well, this frosting doesn’t have any of those exotic, trendy superfoods in it, but it is chock-full of some simple, good old-fashioned foods that qualify as superfoods in my opinion anyways! Pure maple syrup (especially the darker Grade B syrup) is full of trace minerals that have been stripped out of the more refined sweetners like the powdered confectioner’s sugar typically used to make frosting sweet. Raw honey, in addition to containing minerals and beneficial enzymes, also has antibacterial and antiviral properties that make it an excellent choice for a natural healthy sweetener. The scent of vanilla is incredibly relaxing, and with all of the busy-ness and stress that most of us encounter every day, we can use all the relaxation and stress-reduction we can get! Salt has a calming, anti-inflammatory effect on the body, and having enough salt is essential for a healthy metabolism. * Note: Coconut oil starts to melt once the temperature gets above 70 degrees. Depending on how warm your house is, you might have to add a bit more cocoa powder if your coconut oil has melted or you might have to use a bit less if it’s wintertime and your coconut oil is rock solid. If it’s summer time and you’re planning to use this to frost a cake rather than just eating it straight as a dessert, you’ll need to make sure you have enough cocoa powder to keep the frosting stiff enough, or use butter instead of coconut oil. I like to mix and match this recipe depending on what I’m in the mood for and what ingredients I have on hand. I might use coconut oil and raw honey one night and butter and maple syrup on another. All variations are delicious! This recipe makes about 1/2 cup worth of frosting. 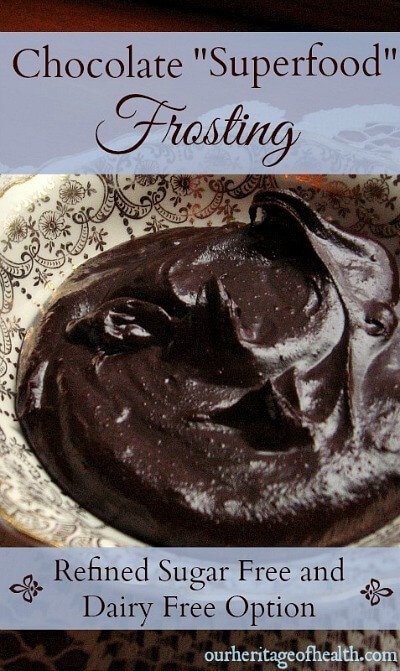 I usually just have a spoonful now and then as a dessert, but you could easily double or triple the recipe if you wanted to use it to frost a cake or cupcakes, like my favorite Depression-Era dark chocolate cake. If you’re a dark chocolate lover like me, this decadent frosting is the perfect “superfood” for times when you want an indulgent dessert. This post is shared with: Real Food Fridays at It’s Your Life. Summer E-Book Sale – Get 30 E-Books for 90% off This Week Only! Yummy! We use a lot of coconut oil around here! I will pin this to keep on hand. Thanks for sharing with us at the HomeAcre Hop ~ we look forward to having you back again tomorrow. i MADE this tonight for a gluten free chocolate cake for a work event tomorrow and its AWESOME and SO easy!! i did triple the amount of maple syrup. i dont think i’ll ever go back to the icing sugar/butter icing again. yay!! Awesome! So glad it worked well for you! Just wondering if you could freeze small mounds of this as chocolates for in the warmer weather? I don’t see why not. Sounds like a great idea! Thank you. I have tried a lot of dairy free recipes and hated them. We have a relative that is extremely allergic to dairy, so this looks promising and easily convertible to dairy when it’s just my immediate family. I have been making this for ages, but I never measure – just eye ball – I don’t frost a cake with it though I eat it straight from the bowl when I need a chocolate fix (he-he) beats running to the store for a candy bar; less expensive, more healthy and I create the portion size I like; just a couple of bites and I’m satisfied. That being said I do dip walnuts or coat sliced banana’s and freeze then serve, all my friends love it too! Thank you for sharing this recipe/idea on a grand scale. It’s exciting to see healthy eating, simple eating shared with the masses. There are delicious options; we’re not slaves to corporate America for yummy goodness! This sounds wonderful! Does it need to be refrigerated, or is it safe to leave it in the pantry? Sounds yummy! How long does it last in the fridge if you aren’t going to use it all in one go? I’ve never actually had any left over because I usually eat it all in a day or two! It should last for at least a week in the fridge, though, I would think. Possibly even longer. Thank you, thank you so much for posting this healthy recipe.. I am saving it to make for the christmas season ! Thanks, Natalie! I just made myself another batch of this today because I love it so much 🙂 I’m so glad you stopped by! I’ve used butter before instead, and it tastes amazing that way too! I modified it a bit to put on top of some Protein-Chocolate Brownies. I used about 3/8 of a cup of Chocolate Protein Powder and 1/8 of a cup of Cocoa Powder. The icing and the brownies turned out delicious! Awesome! Glad they turned out well! I love this recipe. So excited to have a healthy chocolate options. Been vegan for a few months now and thought I had to leave deserts behind. I Put this on a pinto bean cake and black bean chocolate cupcakes. Thanks! I really liked this. I’ve made a muesli bar and I’ve added this chocolate topping on it, and it was awesome 🙂 (I’ve used honey instead of maple syrup and I didn’t had at hand any vanilla or salt, still it was very delicious)! looks great but how much would I need of each ingredient to make enough for a chocolate cake? Good question 🙂 I’ve never actually tried frosting a full-sized cake with this recipe, but for an average cake, I’m guessing you would probably need about 3 cups cocoa powder, 1 1/2 cups coconut oil, 6 Tbs maple syrup, 1 1/2 tsp vanilla extract, and a pinch of salt. You might not need quite so much of each ingredient if you were doing a sheet cake or cupcakes instead of a layer cake. I used Dutch cocoa powder and found this WAY too bitter. Am experimenting with adding extra of the other ingredients, and hope to be able to save it as it’s for a chocolate cake icing. Luckily my bf is rather forgiving…. You could try adding a bit of extra honey to make it a little sweeter, or, if you don’t mind using refined sugar, you could always substitute confectioner’s sugar for some of the cocoa powder. I love dark chocolate, personally, but this frosting might not seem sweet enough if you’re more of a milk chocolate lover. Worked like a charm for frosting (generously) 12 cupcakes. We found the honey taste a little strange so added about 1/2 powdered sugar and a hefty pinch of instant espresso. The coffee flavor really took brought out the chocolatey notes and took it to the next level without making it a coffee flavored frosting. That’s a great idea to add a little coffee flavor! It always complements the chocolate nicely. Just made this, had to add more maple and vanilla because it was a bit bitter. Warmed it a little in the microwave and it was soooo good. I used it to ice the healthy 3 ingredient brownies, then I ate the rest haha. I loved this frosting. I used it on a chocolate cake, I am adding it to my list of recipes to keep. I added powdered sugar in the recipe to make it a bit thicker. I’m so glad you liked it! 🙂 I sometimes add some powdered sugar too if I need to make it thicker, especially in the summertime when my coconut oil gets melty. I used only half the the cocoa because it was so dry, but this is a very good icing recipe! Yum! Yeah, the texture can vary depending on how thick your ingredients are (like if you use really thick honey or if your coconut oil is really solid), but I’m glad you liked the flavor of it! Pingback: My Favourite Healthier Recipes | Healthy or not, I'll have what she's having! Tried it both ways with butter or coconut oil came out bitter and NASTY. –You MUST have sugar or a cup of something sweet to make it like frosting. What tiny amount you use will never make it take any good. I’m sorry you didn’t like it. This frosting is probably an acquired taste if you don’t usually like dark chocolate. I personally love dark chocolate – the darker the better – so the bitterness doesn’t bother me at all, and adding a bit of honey or maple syrup is the perfect amount for me. But everyone’s tastes are different, so this recipe isn’t suited for everyone. Hello there! Is vanilla extract optional in this recipe? Hello! 🙂 Yes, the vanilla is definitely optional. I add it only because I like the flavor, but if you don’t like vanilla it’s perfectly fine to leave it out. I have a problem with your love affair with both coconut oil and butter. The nutrition labels read quite high in saturated fats, which all the doctors tell me to stay away from I have been using Smart Balance for years (but not for baking) and my heart readings have been terrific. To each his own. If I choose to have a love affair with coconut oil and butter, that’s my decision to make, and I stand by my choice to use saturated fats like coconut oil and butter. 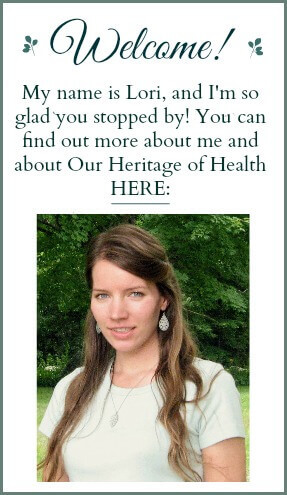 I’m glad to hear that your heart readings have been terrific because good health is much more important than disagreements over ingredients. Hi : can you put the frosting into a bag and use it for decorating/ piping? Or can it only be spread like in the picture? I’ve never tried using it in a bag for piping before, but you could probably try it. It has a fairly soft texture, but during the colder months, it might be just stiff enough to do that. In the summer months or if you live in a warm climate, though, the frosting might be too soft for it to work well. Because of the coconut oil in the recipe, the texture of the frosting depends a lot on the temperature.